Welcome to Drain-Jordan Library, your primary source on campus for books, journals, periodicals, online databases, printing, study areas, archives, reference help, programs, and so much more! This guide will walk you through some of the things you will need to know if you're new to the library, or haven't used our resources before. Visit the Library Hours page for exceptions during breaks, exams, and holidays. Help! The resource I'm looking for is not available through the Drain-Jordan Library. Not to worry, we have Interlibrary Loan for that! With ILL you can request materials from other libraries and they will mail them to us. This can include books, periodicals, pamphlets, and other documents. They generally take about a week or two to come in; you will be notified when they have arrived via your campus email. These books are checked out like any other material, and you return them to us at the end of the rental period. ILL is available to all WVSU faculty, staff, and current students. For an ILL form, see our Interlibrary Loans page on our Library website. A list of the software available on our library computers. We also have laptops available to borrow for 3 hour periods within in the library. If you have already created a Library Card, all you need to borrow a laptop is your student ID. If you have not created a card, follow the steps found in the box at the top right of this page. The Drain-Jordan Library gets daily newspapers from the Charleston Gazette and The Wall Street Journal. The WVSU school newspaper can be found online at YJOnline. Print newspapers can be found in the Periodicals section of the Library. You're allowed to use any public computer in the Library free of charge, which includes the ones in the main lobby and the Library Learning Center (LLC) towards the back on the main floor.. All public computers in the Library will pull up the Library Homepage when you open up an Internet browser. 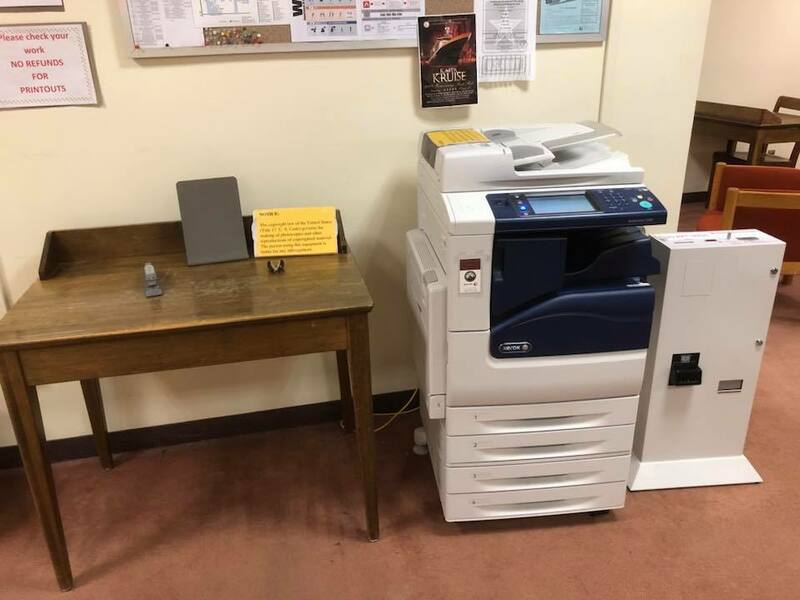 Any computer in the Library can send prints to the library printer. The printer is located near the bathrooms at the main entrance. Each computer station has a number on it, which is how you will identify which print is yours from the print queue. It's 10¢ a page for black and white printing, and 50¢ for color. If you're printing double sided, it's 20¢ a page. Your computer should automatically select the correct printer, but if not select Xerox-LCirc on ps2. This applies for printing from the laptops as well. 1. Put money into the coin box located to the right of the printer. It accepts up to $20 bills, but keep in mind that it will return your change in coins, so you might not want to put in larger bills (unless you need lots of quarters for laundry). You can get change for large bills from the circulation desk. We do not accept credit cards. 2. From the main screen on the printer, find the number that corresponds to the computer you were sitting at. Select that number on the touch screen, and hit the green "release" option. 3. You may need to put more money in the change box if you go over the amount you initially entered. After you have finished, it will return your change. If it hasn't, hit the silver button at the top of the change box, and any change should come out. *If you need help at any time throughout this process, ask someone from the circulation or reference desks; We're always happy to help! To print in color from any of our Library computers, there are a few additional steps you'll need to take. Simply selecting "color" will not get you colored prints, even if your image appears in color in the print preview. 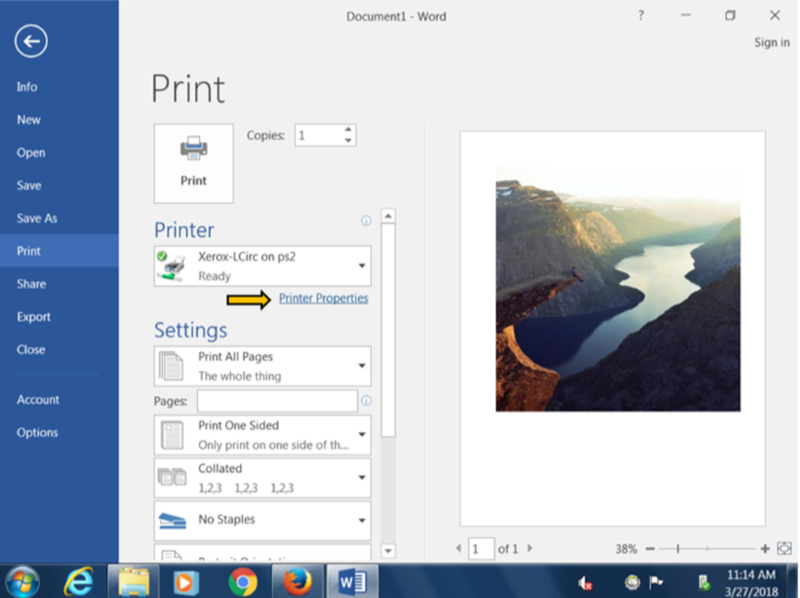 The screenshots below are the steps for printing from a Word document, but the same basic steps should apply to multiple formats in Microsoft Office, including PowerPoint, Excel, Publisher, and Outlook. 1. From the print screen, select Printer Properties (see screenshot below). If you are printing a PDF, it will simply say Properties. 2. This will take you to a screen like the one below. From there, click on the Image Options tab at the top. 3. Once you have done that, make sure that the Xerox Black and White Conversion box is unchecked (see screenshot below). This is automatically checked for most of our computers, so this is what's throwing you off when you go to print in color. After that hit OK, and it should take you back to your main printing page where you would hit Print to send it to the printer. 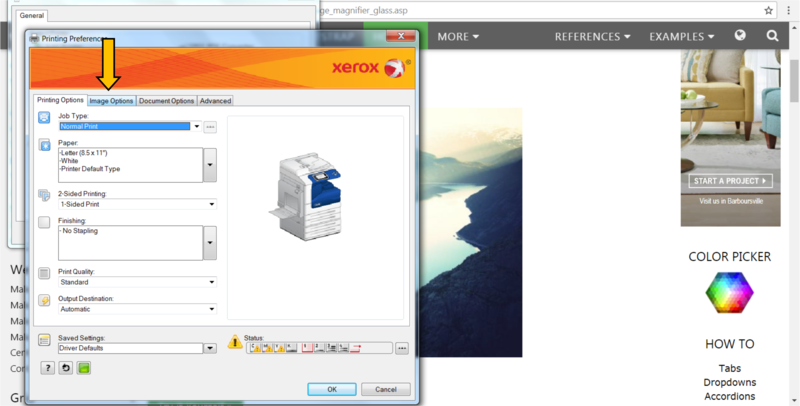 For more on using the Xerox printer, click on the Printing - General tab at the top of this box. If you have any questions throughout this process just ask someone at the Reference Desk and we'd be happy to help you. *Printing in color is 50¢ a page. The screenshots below are the steps for printing in color from the Internet or a website. These steps may apply to printing from other formats as well. 2. This will take you to the General system dialog page. From here, select Preferences (see screenshot below). If your printer is not Xerox-LCirc on ps2, go ahead and select that now. It should default to this printer automatically. 3. 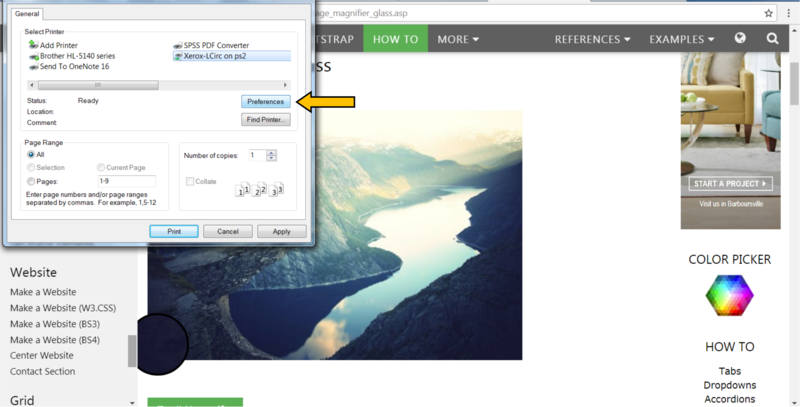 From the Printing Preferences menu, select the Image Options tab at the top of your screen (see screenshot below). 4. 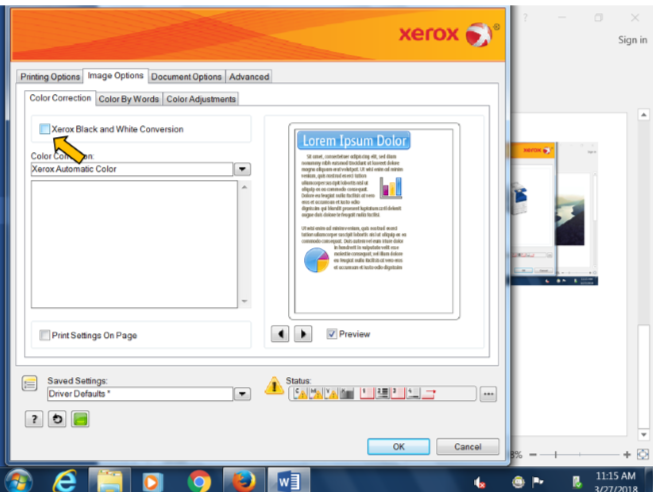 From the Image Options menu, de-select the Xerox Black and White Conversion box (see screenshot below). This box is automatically checked on all our computers, which is why your prints come out in black and white even if you have selected color in the print preview. Food and drink are allowed in the Library, provided you follow some simple guidelines. You are not allowed to have drinks anywhere near a computer, microfilm machine, scanner, printer, or in the Archives and Special Collections. All drinks need to have a lid or cap. We also ask that you avoid messy food (such as hot meals or sandwiches) or anything with a strong smell. Please be courteous and throw your trash away in the receptacles provided. I want to check out a book, but I have never been in the library before. What do I need to do? Great question! Every library is a little different, but here is what you'll need to do to check out a book at the Drain-Jordan Library. 1. You'll need to have a current student, faculty, or staff ID. We do make some exceptions for alumni, but you will need to get permission from the Head of Circulation, Diana Haberfield. We also allow community members to apply for a card, but you will need to have an ID and fill out a Special Patron ID form and get it approved. 2. Stop by the circulation desk (located right when you walk in to our main entrance). To apply for a Library Card you will need to fill out a short form. This only takes about ten minutes, and will only need to be done once. This is how we keep track of everyone so we can make sure to get our books back. This is not a physical card that we give to you, but rather one that we keep for our records. 3. Once you've filled out a form and we have a library card on record, all you need to check out books, laptops, and use Interlibrary Loan is your student ID or drivers license. Happy reading! WVSU and the Drain-Jordan Library offer free WiFi to anyone on campus, not only current students, faculty, and staff. Simply connect to the WVSU-Wireless open network. For more on textbooks and buying options, as well as additional sources for eBook access, check out our Textbook Options and (Free) Open Access Materials guide. 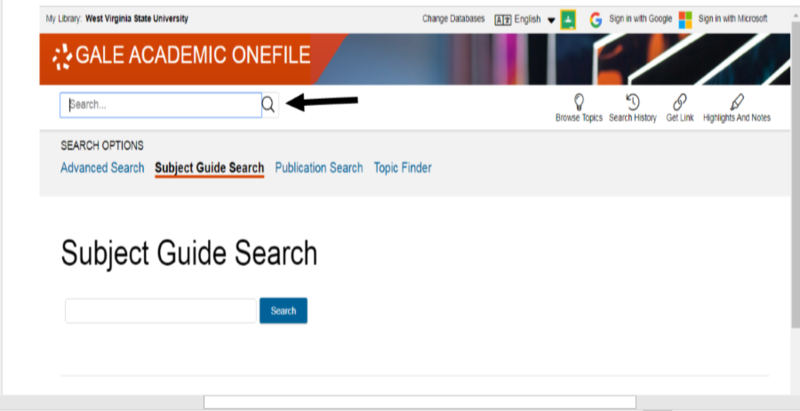 For more on choosing a topic, evaluating a resource, citing, and tips and strategies, consult the User Education tab on our Library website. Use the tabs at the top of the page to find more resources. Or, if you're still having trouble, Ask Us!